High blood pressure (also known as hypertension) is common in older people. Around 25% of middle aged adults have the condition, and this rises to 50% in retirement. High blood pressure refers to the pressure of the blood as it pumps through your arteries. High blood pressure is classed as being a reading that is above 140/90 mmHg on each occasion that your blood pressure is taken. This article offers advice on spotting the signs of hypertension and dealing with the condition. Hypertension often has no visible symptoms, which can make it difficult to detect. Most people are diagnosed as a result of their blood pressure readings (see the following section for more on this). If your blood pressure reading is high on a single occasion, you will usually be observed by a doctor or nurse, who will monitor your blood pressure over a certain length of time. 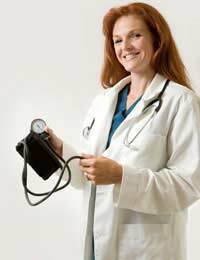 If your readings are repeatedly high, you will be classed as having high blood pressure. You may be advised to buy a home blood pressure testing kit so that you can keep an eye on your blood pressure outside of the surgery or medical centre. Many people find that their blood pressure is more normal when they are not anxious. However, if your blood pressure readings are still high even when you are in a more relaxed setting, this is often a cause for concern. Once the initial observation period is over, you may be given medication to help control your blood pressure, along with advice on changing your lifestyle to deal with your condition. Your doctor may also suggest blood and urine tests, and in some cases, an electrocardiogram (ECG) heart test. These are designed to try to pinpoint the cause of your high blood pressure. Changing your diet can help to lower your blood pressure, which can in turn reduce your chances of having a heart attack or stroke further down the line. Cutting down on your salt intake is a particularly important part of this as it plays a prominent role in hypertension. Many foods contain a lot of added salt, so you don't need to add salt to your food. Choosing options with no added salt are a good idea too. Eat as many portions of different fruit and vegetables as possible, limit your fat intake, and plan your meals so that they are predominantly starch-based, such as potatoes, rice or pasta accompanied by vegetables or salad. Changing your diet can have a direct effect on blood pressure, especially when combined with other lifestyle changes. Taking regular exercise can lower blood pressure. If you aim to exercise for thirty minutes on at least five days of the week, you will often see a healthy reduction in your blood pressure readings. Drinking less alcohol can also reduce blood pressure. Alcohol in moderation can help to protect against heart disease, but too much can raise your blood pressure. For men, the recommended alcohol intake is no more than 21 units per week. For women, it is no more than 14 units per week.